The World's 10 Most Incredible Buildings Made Entirely of Wood - Jacaranda, Inc. Humans have been making shelters out of trees since the Stone Age, when they used animal hides, branches and rocks to protect themselves from the elements. Today’s architects and designers have come a long way from those primitive tools and techniques, and today, while wood remains one of the most versatile and beautiful materials, buildings constructed of it can range from the deceptively simple to the intricately detailed. Keep reading to learn about some of the most incredible buildings made entirely of wood. The Mae Tao Clinic has provided shelter and safety to some of the many refugees from Myanmar via the Mae Sot Dormitories. These spacious dormitories, which can house up to 25 people at a time, are made from recycled timber and locally sourced bamboo and feature thatched roofs. They are designed by a.gor.a Architects, a firm committed to offering sustainable solutions to marginalized and underprivileged people. Even a bundle of firewood can serve as inspiration for Li Xiadong, the Chinese architect whose vision ultimately resulted in the LiYuan Library. The LiYuan Library is designed to allow plenty of natural sunlight to filter through the sticks, which were locally sourced from fruit trees. Children in Trondheim have no need of blanket forts thanks to the Fireplace for Children. Haugen/Zohar Arkitekter modeled the cozy structure on Norwegian turf huts using leftover construction materials. Pine circles are layered to allow natural light during the day and create a chimney effect while sliding doors offer security. The once-thriving fishing community of Fogo Island in Newfoundland and Labrador is a tiny but beautiful destination with stunning seaside views and brightly colored homes. 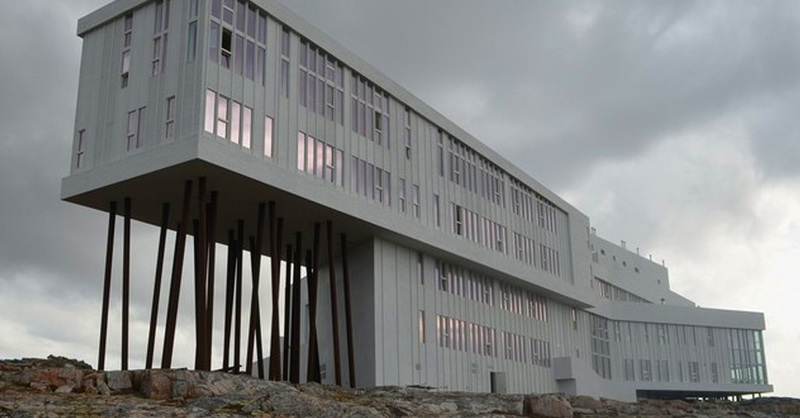 One of its unexpected gems, however, is an architectural masterpiece: the Fogo Island Inn. Saunders Architecture drew its inspiration from the attractive simplicity of the local cottages. Churches have long been known for their breathtaking architecture, but the Knarvik Community Church goes a few steps further with its stark angles and steep peaks and the mottled pine drawn from the heart of the tree. It was designed by Reiulf Ramstad Architects. All work and no play can lead to a pretty boring day, which is why Vienna-based architects heri & salli wrapped the office building with a timber grid where employees can grow plants or, when feeling more adventurous, go rappelling. 7. Mason Lane Farm in Goshen, Ky., U.S.
Big red barns are common sights in farm country, but at Mason Lane Farm in Goshen, De Leon & Primmer Architecture Workshop created an airy barn that avoids tired stereotypes of what farm storage should look like but is still ideal for drying hay. It was built using locally grown bamboo. Barns were used as the inspiration of Timber Home. Kühnlein Architektur created two structures resembling barns and joined them at the center. Silvery weathered larch strips cover the exterior, allowing plenty of natural light to filter inside while offering privacy to the private home’s inhabitants. This private home was inspired by Soviet-era country houses. Russian architect Peter Kostelov added a contemporary spin with wooden cladding applied at an angle to add rich texture, visual interest and beauty. Tham & Videgård Arkitekter designed House K, a pine framework house with a roof terrace, bright window blocks, white ash details indoors and black-stained panels outside, to sit at an angle on the plot for maximum visual effect. Few materials offer the versatility and raw beauty of natural wood. Jacaranda, Inc.’s real wood veneers are used in many healthcare facilities, educational institutions, corporate offices, public spaces, performing arts centers and hospitality industries. We use a patented process to maximize the yield of each log, minimize the environmental effects and provide our clients with an extensive array of enhanced species and rare and exotic patterns, colors and designs.